As with all cutthroats, check first for the distinct orange-red cutthroat slash below the jaw. 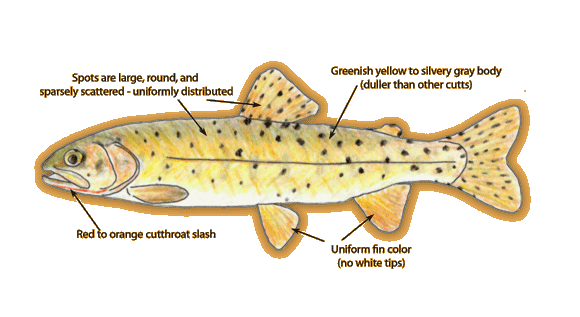 The Bonneville Cutthroat can be distinguished from other cutthroats by its fairly plain, greenish yellow to silvery gray body and uniform spots. Compared to other cutthroat whose range overlaps or abuts the Bonneville’s: a Yellowstone Cutt will have similar number of spots, but they will concentrate more towards the tail; the Snake River Cutt will have many more, fine spots over its entire body, concentrating in the tail; a Westslope Cutt will have more small spots by the tail and none on its flanks near its pectoral fin; a Colorado River Cutt will generally exhibit much brighter colors, with a bright, golden yellow body, a brassy green back and an orange tint along the belly.